Cuore pulsante del capodanno musicale messinese è il Concerto per pf e orchestra n. 2 in do minore op. 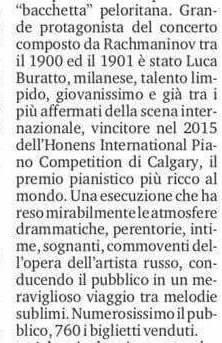 18 di Sergej Vasil’evic Rachmaninov, solista il giovane Luca Buratto, vincitore dell’edizione 2015 dell’Honens International Piano Competiton di Calgary. Di Buratto interprete, sin dai primi accordi, emerge la definita personalità ed un sentire profondissimo, lucido, mai eccessivo: con un fare abbandonato alla purezza di suono e sentimento e la postura, il movimento che, a tratti, ricordano Gould sulla storica sedia, Buratto va a toccare le corde più sensibili con un’ assortita gamma di colori che va dall’autentico, al pirotecnico, al cristallino. Buona l’intesa con l’Orchestra ed il maestro Alibrando, sinergia immediata ed intensa che ha prodotto pagine di estrema delicatezza come l’Adagio sostenuto, intriso di lirismo e cantabilità. 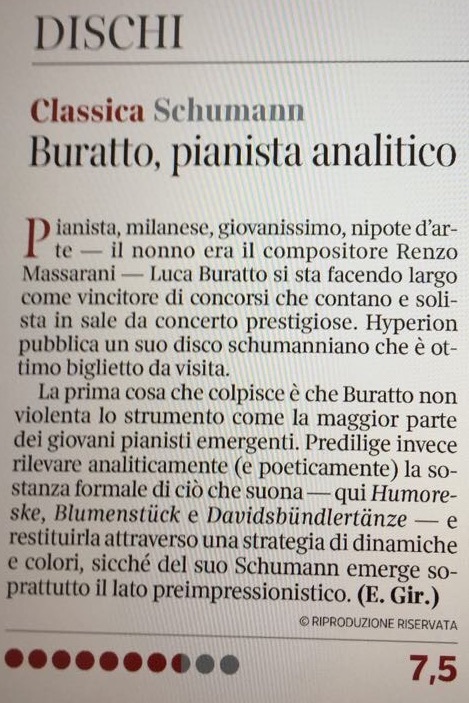 Richiamato più volte sul palcoscenico, il maestro Buratto ha, inoltre, regalato un’intima esecuzione de Davidsbündlertänze, op. 6 n 1 di Robert Schumann. The great novelist’s description could apply, in varying forms, to all the choices of Luca Buratto last night. The young Italian’s selections were iconoclastic, even daring. So, while I had never previously known of the pianis, attending this concert was mandatory. In a way, Mr. Buratto, still in his 20’s, offered a biography in the program equal to the music. We learned that he loves table tennis, jigsaw puzzles, physics and post-modern American literature. (Good!). And that his great-grandfather studied with Respighi (interesting), but because of Jewish origin, his music was banned by Mussolini. (Tragic) That he was given the Honen Prize Laureate two years ago, amongst countless other prizes (Well deserved). And that he loves Robert Schumann, which was obvious after his dynamically intense performance of the Schumann Humoreske. Mr. Buratto is a demon on the keys, of course, but hardly took advantage of his fine technique to give an overly incendiary interpretation of the Schumann. The work is rarely played because–like two of the other works on the program–it seems at times to be so impulsive, almost ungainly. Yet in his own way Mr. Buratto overcame these difficulties. Despite the title, the Humoreske is hardly humorous, and only in the “somewhat pompous” section did he even dare to write irony. Mr Buratto never allowed the pompous march to become satire, nor did he dream away the dreamy measures or allow the charming melodies to become bathos. Instead, he attempted to bring a cohesion to Schumann’s impulsive creations. That was impossible, of course, since the composer darted from dazzling counterpoint to childish lyrics, from stases which seemed to reflect Beethoven’s late Bagatelles to languid Chopin-like inspirations. What Mr. Buratto possesses, though, is the good taste (almost too good taste, though never prissy) to appreciate each episode for its own worth, allow us to enjoy it and–like tasting from a fine buffet–move on to the next episode. In his five works spanning three centuries (and without a single brazen audience-pleaser in the lot! ), he began with György Ligeti’s four etudes from the Troisieme Livre, starting with the deceptive White on White. And how carefully Mr. Buratto went through the Medieval almost Arvo Pärt-like gentle discords. It was played calmly but underneath was a suspension of breaths. The next Pour Irina was less clever, but a more interesting set of canons, leading to the headstrong Breathless. No homage to the great film, but another canon which Mr. Buratto bounced up and down the keyboard. The pianist showed his incredible technique twice. Once in the encore of Debussy’s L’Isle joyeuse. But first in this finale Ligeti study, Canon, which begins with Vivace and continues–with Ligeti’s unshakeable humor–onto Presto impossibile!!! The Janácek’s “From the Street” Sonata was a staggering contrast. Outside of a few quirky works, this is a composer for whom every note is a serious world in itself. Thus, he needed few notes indeed for his picture of a tragic political incident. Mr. Buratto, one believes, is a man of political understanding, and the work was played with an understanding of the dramatic possibilities. Not “Schumann” drama, but a sense that the themes (or cells parading as themes) could meet, confront each other, depart for other worlds. At any rate, this was not great Prokofiev. One has a feeling that the artist is trying to hard to balance his physical wonders with his cerebral taste, and in the Prokofiev, that good taste was dominant. So finally we came to the work which involved impulse, intellectual power and extreme difficulty. Thomas Adès’ music involves all three, just as his composition, pianism and conducting are never-ending wonders. Typically, Traced Overhead used Greek words for the three movements. Typically, one had to follow each note to discover what was happening. And also typically, the composer–like Schumann and Janácek–would sharply change course from one mood to another. He started with a quick arpeggio, let it descend, played a series of gorgeous riffs and then worked into his Aetheria, a stratospheric discovery which never made sense logically–like a dream itself–but had its gorgeous measures. Again, without a break, Mr. Adès went into, what I felt and what Mr. Buratto enjoyed most–Chori–three choruses. And in a score I found on YouTube, Mr. Adès had to use four staves for the two-handed work. Not that one could tell this. Mr. Buratto played the three chorales as if the complexities never existed. Mr. Adès worked them to their utmost, then let loose with measures of pure Chopin (or Rachmaninoff!) before the end. The composer was in the audience, saluted Mr. Buratto, and, like the rest of us in Zankel Hall, realized we were experiencing an artist who is both illuminating and unafraid. Do not be put off by the cover, which shows two Victorians of different gender having a pre-Raphaelite snog. What they look like post-Raphael is left to the imagination, as is any thematic connection between Gilbert Baldry’s The Kiss and a set of Schumann pieces that evoke male friendships. Not long ago, record companies employed picture researchers and their covers bore some relevance to the music inside. These days, the images seem to be picked by a computer linked to the Amazon sales chart. Do not be put off either by the coupling of Schumann with a record newbie whose name you may not recognise. 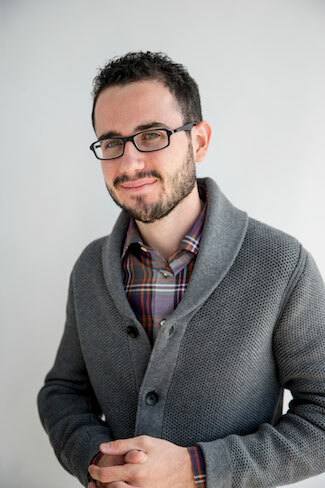 Luca Buratto is an Italian who won the Honens competition in Canada a couple of years ago. It then took a year for him to cut his first record and a further year to get it released, such is the breathless haste of classical commerce in the digital era. For once, it has been worth the wait. Schumann is not designed for debutants or people in a rush. His wild enthusiasms and morose interludes — probably the most precise musical pathology of a bipolar personality — require intense individual contemplation before an artist can make more than pretty gallery pictures of his pieces. Buratto offers no concession to drawing-room romanticism. There is a rather touching hesitation in his entry to the Humoresques, along with a refusal to be charmed by Schumann’s observations of his lusty pack of David-and-Jonathan pals. This is a reasoned assessment, at times a serious analysis, of a work of music that dances on the very cliff-edge of sanity. Buratto, wise beyond his years, is definitely a talent to watch. "Assured performer, he (Luca Buratto) plays with impeccable technique". "The session was informal and intimate, opening with the fiery Appassionata Sonata from Buratto's capable hands."